Drawing Tips- The Differences Between Male and Female Faces, Heads, Skulls This video will illustrate the differences between male and female faces. In part 1 of this video, I will compare male and female facial features, bone structure and musculature. In the in the second part of this video, I will do a demonstration. During this demonstration, I will review what we learned in the first part and teach you how to draw the nuances of the male and female face for artistic (art) purposes. During my demonstration, I use a pencil an eraser and a blending stick (stub) also known as a tortillion. Lets look at the differences of the male and female skull first and then we will work our way up to the skin. Male and female children have similar skull shapes. But once children hit puberty, the differences start to appear. Testosterone provokes the growth of certain facial features in males, while female faces remain relatively childlike. The presence of higher levels of testosterone give men a thicker bone structure with more prominent bones. Male faces have a wider, more prominent jaw, chin and cheekbones (also known as the zygomatic arch). The physical size of the male skull is usually larger than the female skull. A very distinct characteristic of a male skull, is a protruding supraorbital ridge also known as a brow line. Female faces are more rounded and tend to have a narrow jaw line. They have a softness that the male face lacks. It carries more fat than the male face, especially in the cheeks. Female faces tend to have thicker lips and a higher arch on the top lip. Female eyebrows generally sit a little higher than male eyebrows and they usually have a thinner and more arched shape, mainly due to plucking. The female nose tends to be smaller, shorter and have a narrower bridge and nostrils than the male one. Also, female noses often have a straighter or more concave profile. 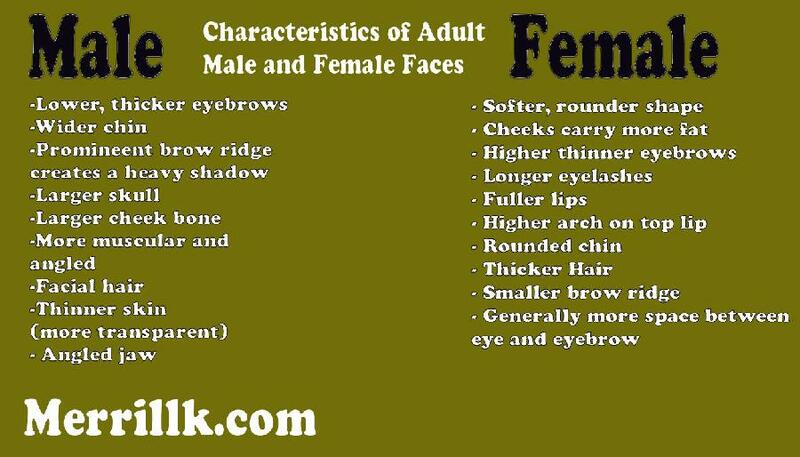 Men tend to have thicker and lower eyebrows than women. The male jaw line is wider than the female chin. It is also more muscular and square in shape. The lips are thicker and more full on a female. Also there is less of a distance between the arch of the top lip and the bottom of the nose. Before we go on to part 2. I want to make this complex subject as simple as possible so I took notes for you! If you are watching this on youtube hit the link. If not, just go to my website Merrillk.com and type skull in the search box and download this cheat sheet for when you draw. Merrill Kazanjian is a contemporary artist based in New York City. He is also a New York State Certified Art instructor with 8 years of experience. He specializes in drawing, painting and mixed media art.